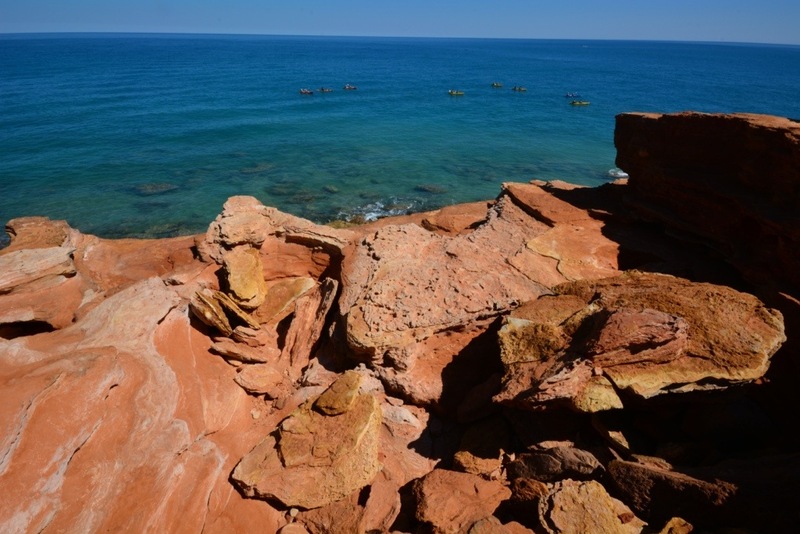 We know you have already seen lots of photos from Broome from our little video but we wanted to include a post about what we got up to in Broome for the five days we were there. The short answer is not a lot! 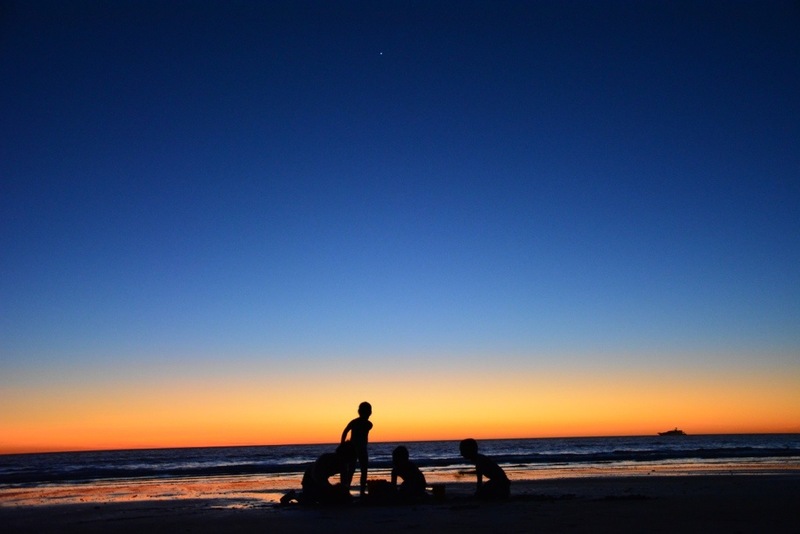 Lots of swimming and hanging out at the beach watching sunsets mostly! 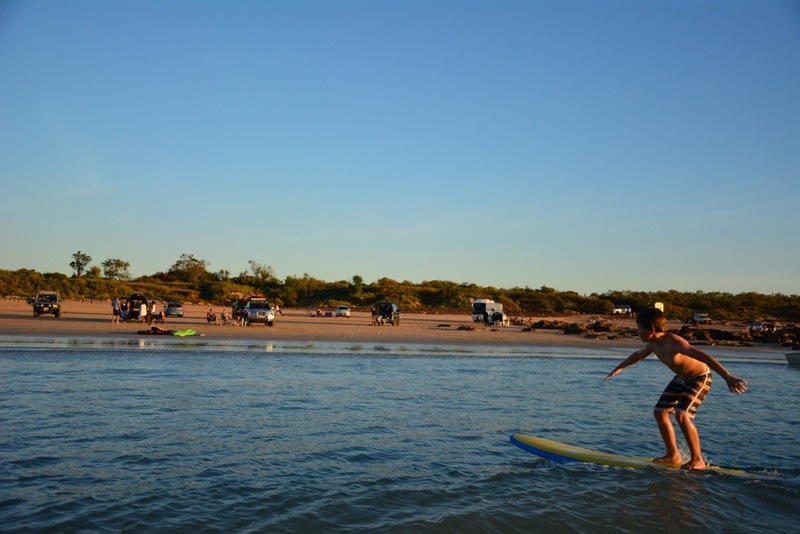 We loved Broome! From Lake Argyle we had a big day in the car and pushed three quarters of the way along the just over 1,000 kilometres to Broome along the Great Northern Highway. 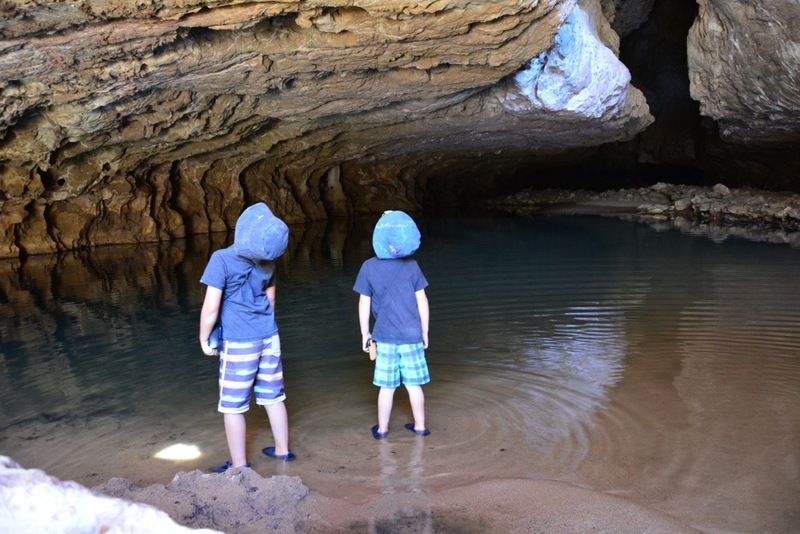 Unfortunately as we were now running on a time schedule we had to bypass the Bungle Bungles on this trip – definitely something we would like to visit next time though!! We camped at a rest area just west of Fitzroy Crossing for the night and managed to get up and away early the next morning (second rig out of the campsite that day – a record for us – it is very difficult to beat the Grey Nomads onto the road in the mornings!!!) 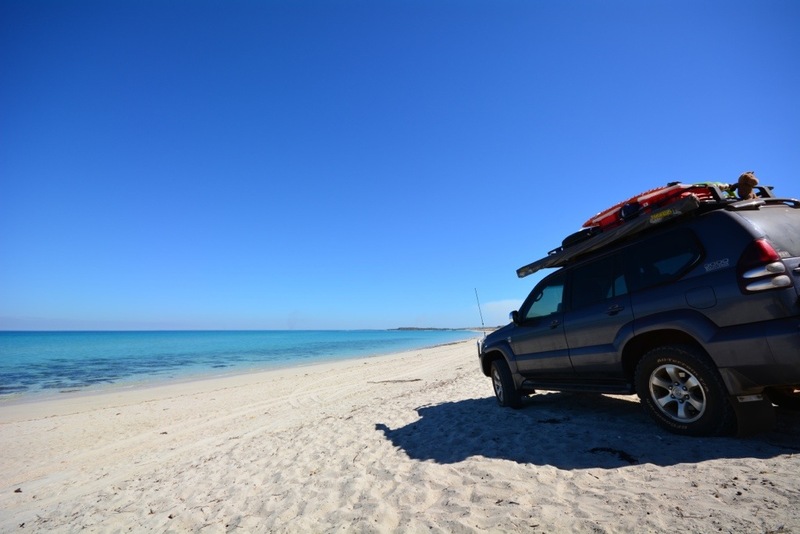 and we arrived in Broome just after 10.30am in the morning. 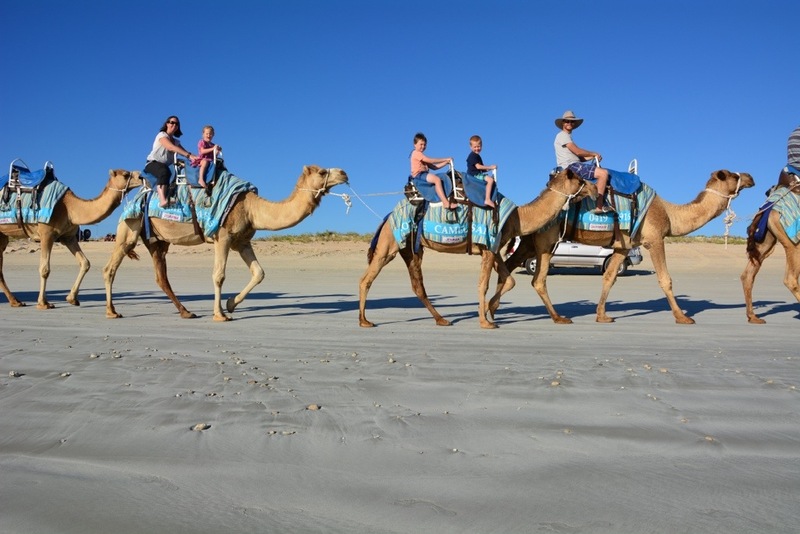 We managed to get a great site close to the amenities and pool at the Cable Beach Caravan Park. The caravan park was huge and filled to the brim but it was lovely and shady with very clean and modern amenities. The swimming pool was fantastic and the kids loved it even though it was freezing cold while we were there. 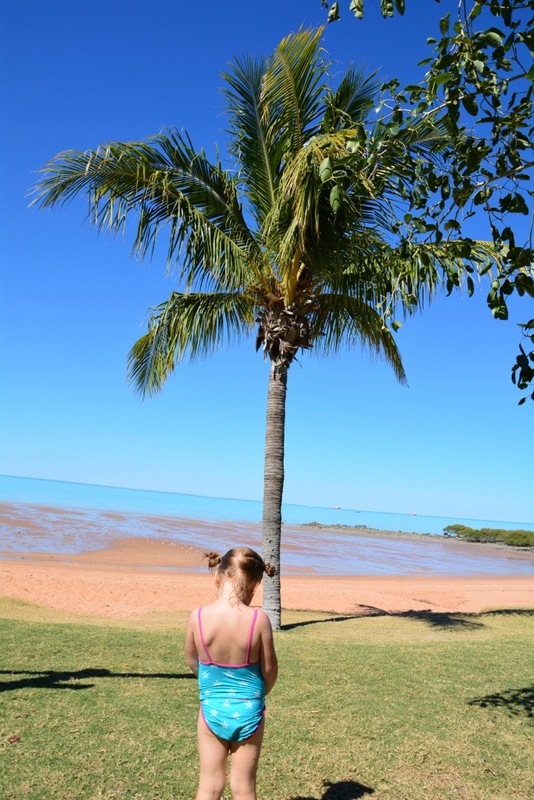 It was expensive at about $70 per night for our family of five but all of the accommodation in Broome is expensive so we thought it was pretty good value for money! 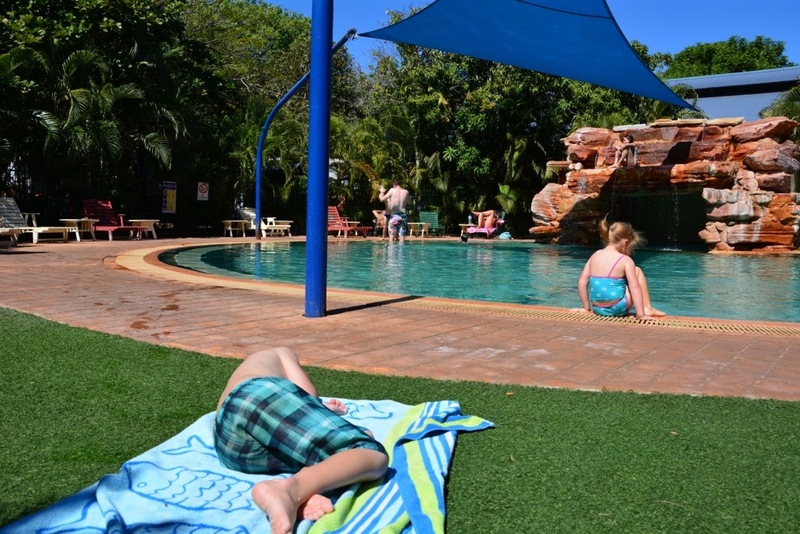 There were aqua aerobics classes happening in the pool and craft circles and a muscian performed one night we were there too so definitely heaps to do at the caravan park and the staff were lovely! 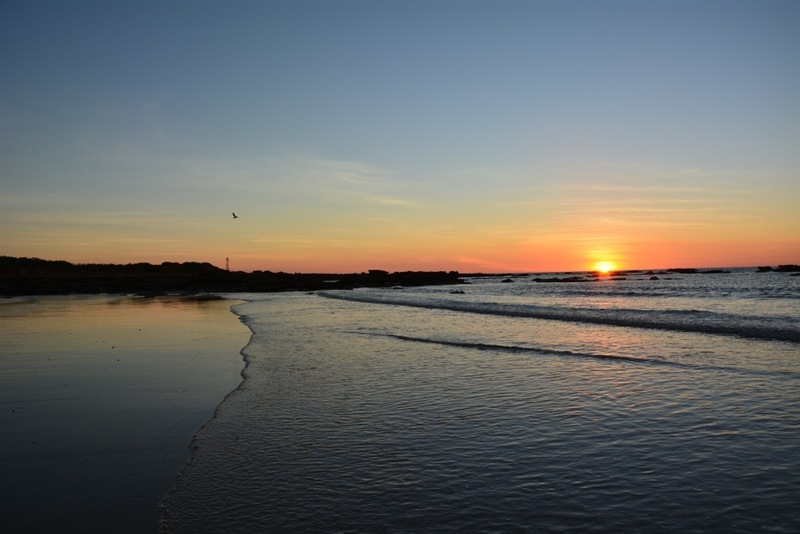 Even though we really liked the Cable Beach Caravan Park, I think next time we would stay at the Roebuck Bay Caravan Park which is closer to town and located right on the beach at Roebuck Bay. 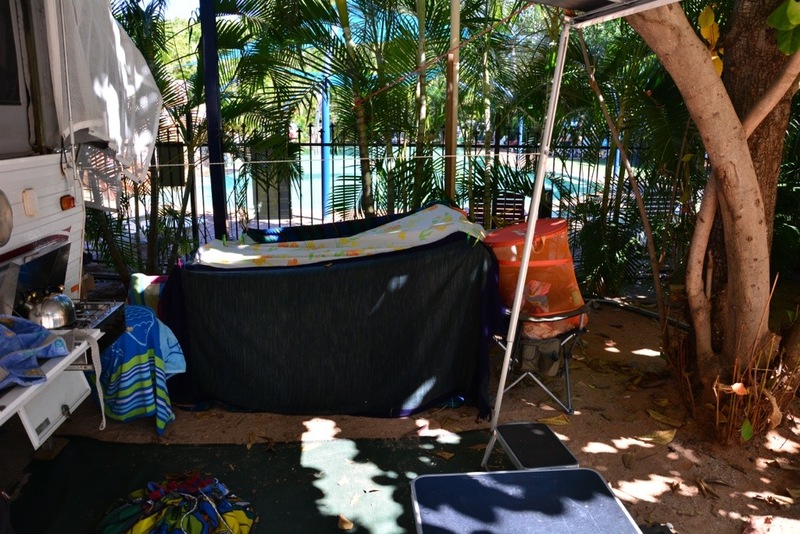 It is also right beside a great kids playground and small water park and has a nice little cafe right on site. I don’t know what the amenities etc are like at the Roebuck Bay Caravan Park but we spent a lovely morning at Roebuck Bay exploring the rock pools and playing in the playground and water park – it would have been great to be camped right there I think – definitely with small kids like ours who dig all that stuff! Lex not wanting her photo taken at Roebuck Bay – I was trying to capture the beautiful colour of the water!! 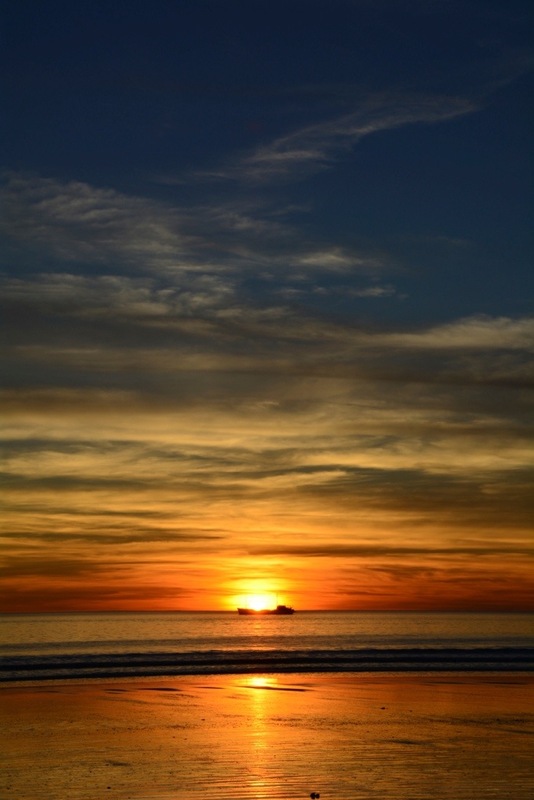 We spent a couple of afternoons watching the sun set over cable beach which was just spectacular and a real treat to watch the sun set over the water for us East Coasters!! Matt got sooooooo many great photos down there it was hard to choose just a couple for the blog! 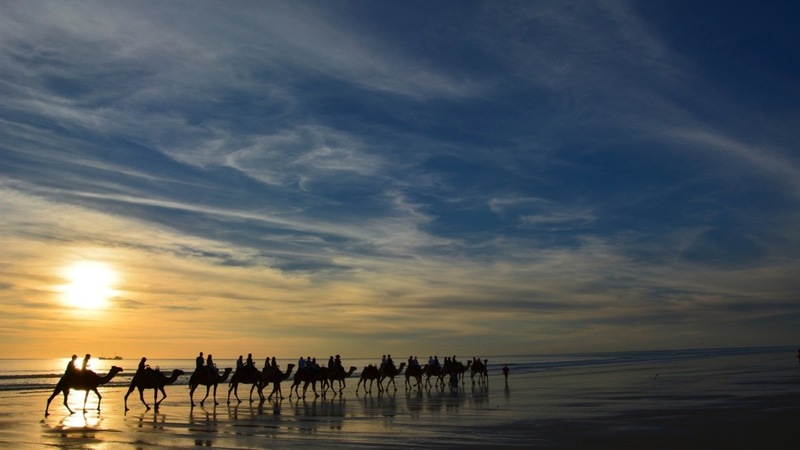 It was soooooo exciting to arrive in Broome after so long in the cold and dirt and dust – we were all in heaven!! Peter Prado on the beach – so different to the dirt & dust! We caught up with Matt’s Dad and Rema again in Broome and finally cracked open our bottle of champagne (a gift from Hans & Ang when we left Brissbane – thank you guys!!!) on the beach for an evening picnic! 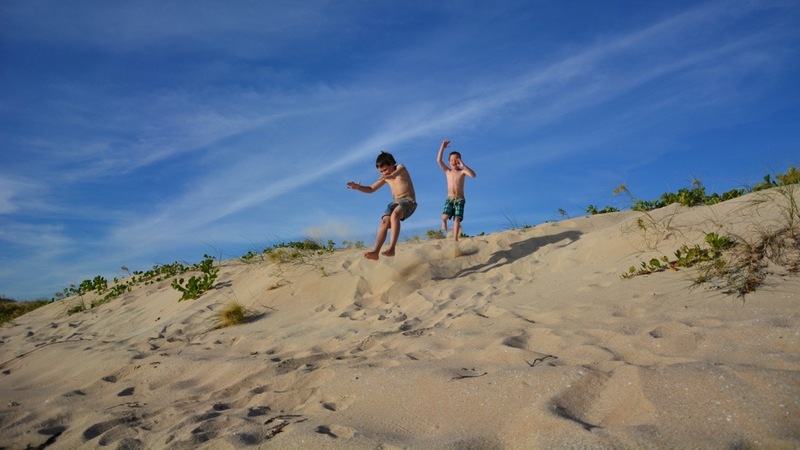 We also met another lovely family that afternoon (big hello to the Rollason family – their blog is Rollinroundoz – check it out for some great photos!) and the kids had a great time playing with their new friend ‘Sam’ (sorry James – they just kept calling you that – I think you will always be Sam in our house!). 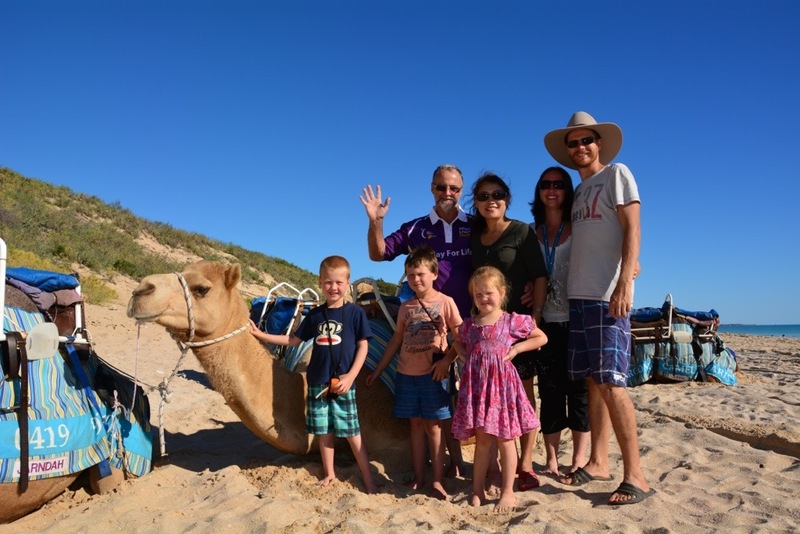 We got to meet up with the Rollason’s again at Middle Lagoon which was great! Sunset picnic to finally open our bottle of champagne from Ang & Hans! 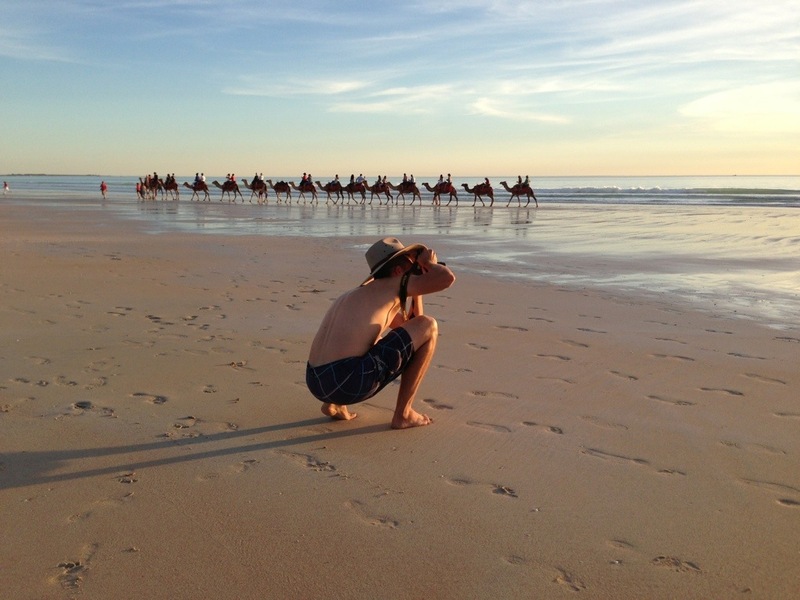 Just your ordinary day for Peter Prado – on the beach with camels walking past! 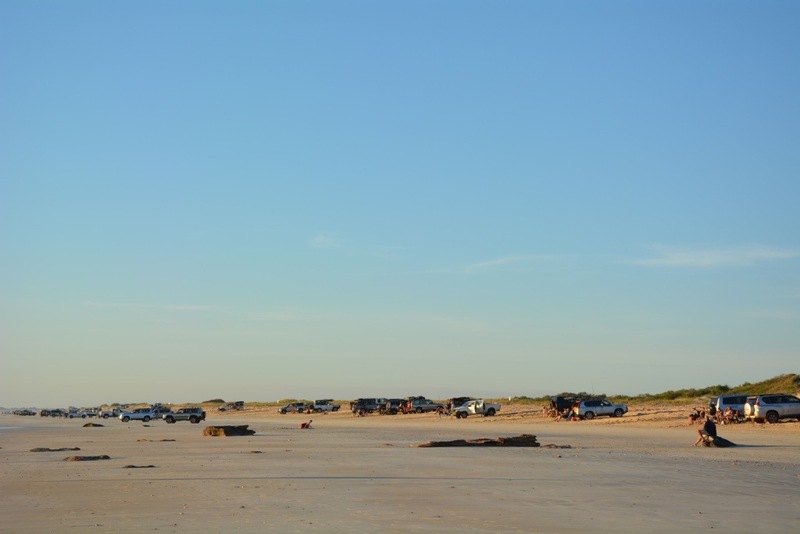 The car park that is Cable Beach at sunset! 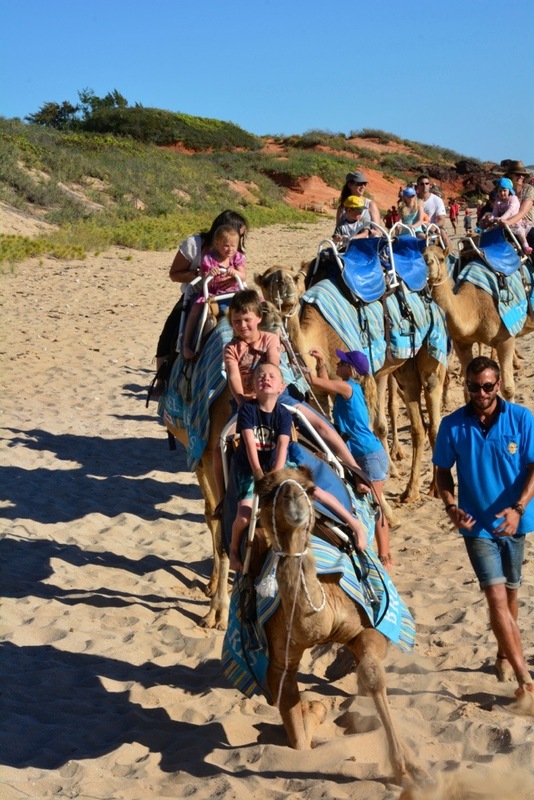 And we did of course do a camel ride which was fantastic! Pretty reasonably priced at I think $140 for our whole family for a pre-sunset ride of 45minutes. We choose the pre-sunset ride because it was the cheapest and shortest. 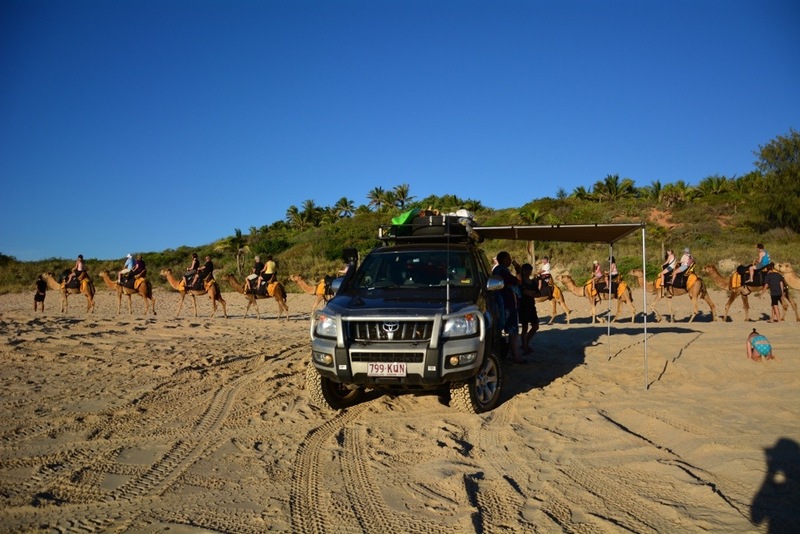 We thought that would be long enough for the kids and we wanted to be able to watch the camels go past at sunset – not be riding them – we were pretty happy with our decision. 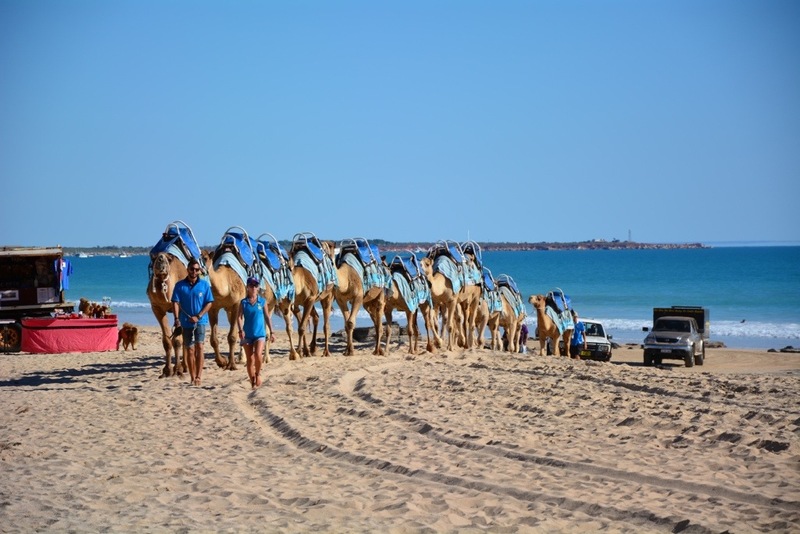 We choose the Blue Camel tour – run by Broome’s original camel lady Alison Bird – and I got a pair of tiny pearl earrings! Tobes was a little bit frightened! We also spent a lovely afternoon at Gantheaume Point. We had a wonder around the rocks up at the Lighthouse where at certain times of the month with very low tides you can spot dinosaur footprints – unfortunately the tide was too high when we were there. We ended up bumping into our next door neighbour from the campground (hello Marika and the boys!) at the point and they were very kind letting our kids have a turn on their surfboard and skim boards in exchange for a go on the green kayak. 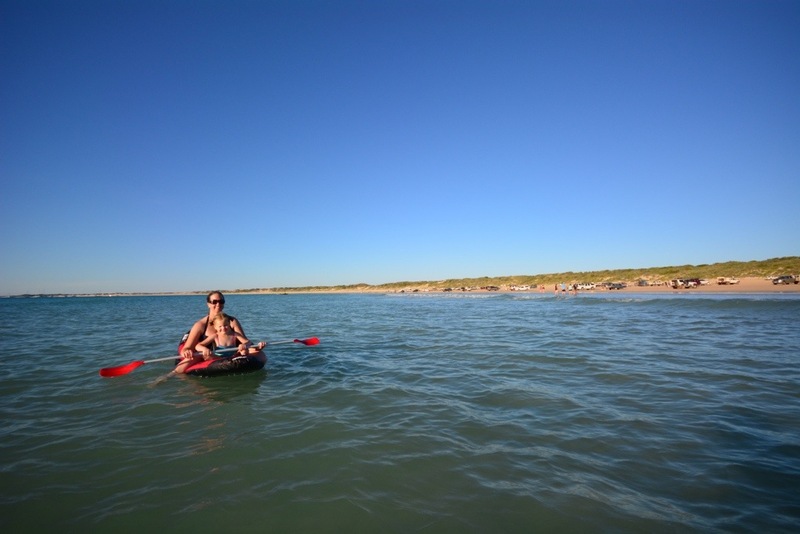 Lex and I had a good paddle around on the kayaks. It was another beautiful afternoon! 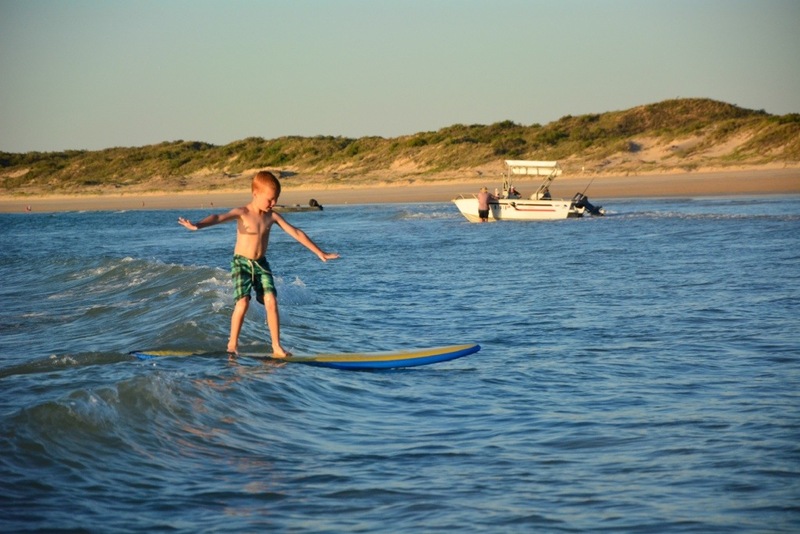 Toby’s first go at surfing and he managed to stand up first go – it was a fantastic surfboard for kids – thanks Marika!! 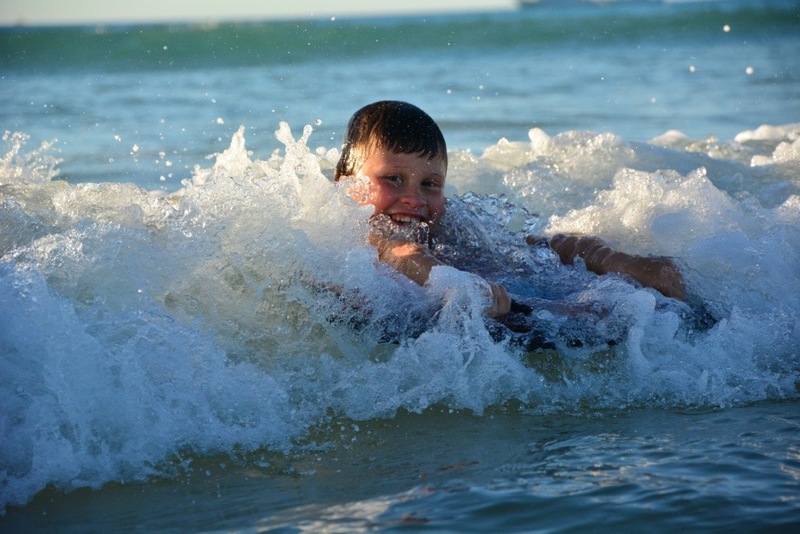 Jacko’s first turn too – they made it look easy! 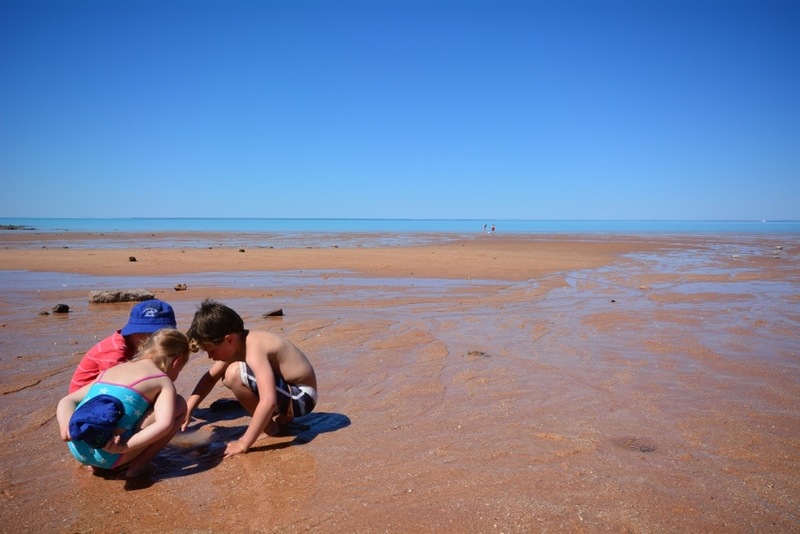 On our last day in Broome we spent the morning at Riddell Beach. 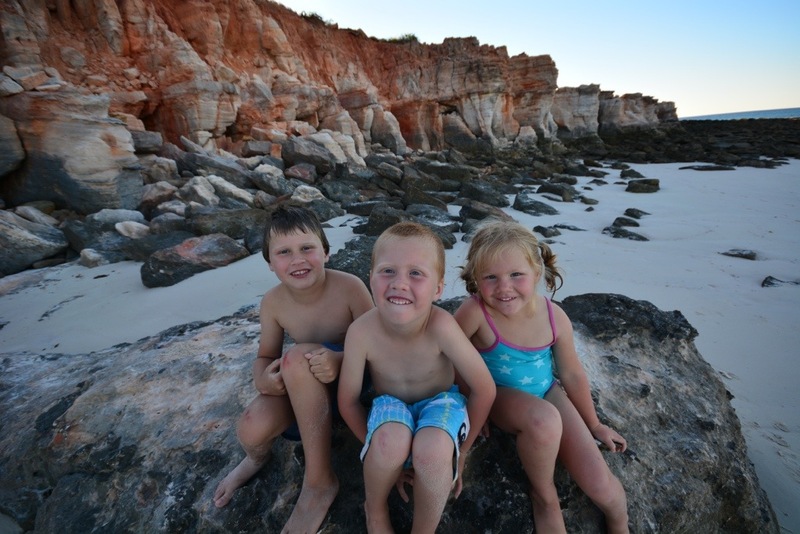 It was rockier and redder than Cable Beach but we loved it as we had it to ourselves – it was very quiet! On the way home we picked up some fresh prawns from the fish co-op and had yummy prawn sandwiches for lunch – so good! 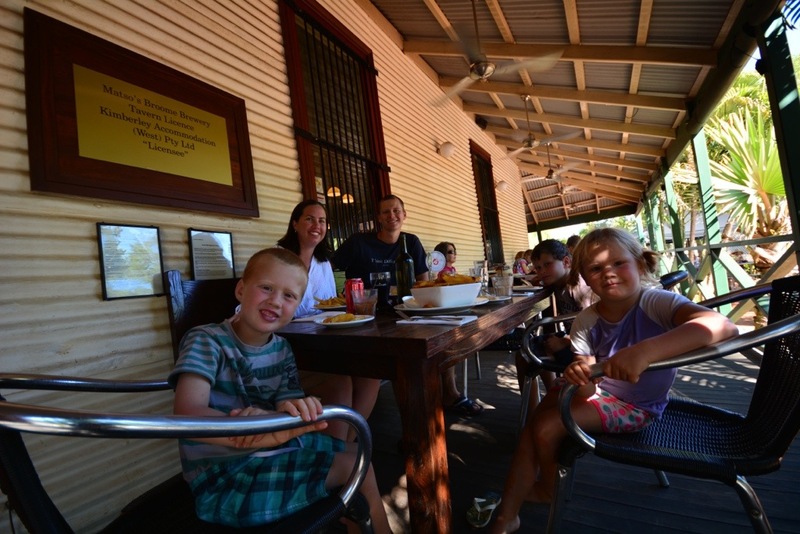 Oh – nearly forgot – we also squeezed in a lunch at Matso’s Brewery which overlooks Roebuck Bay – reasonably priced and delicious! 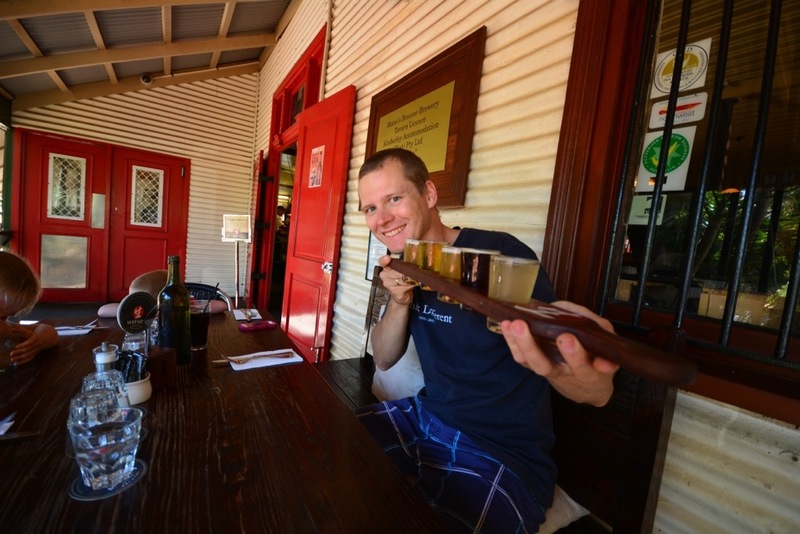 We had a voucher for a free tasting paddle with lunch so Matt was happy! 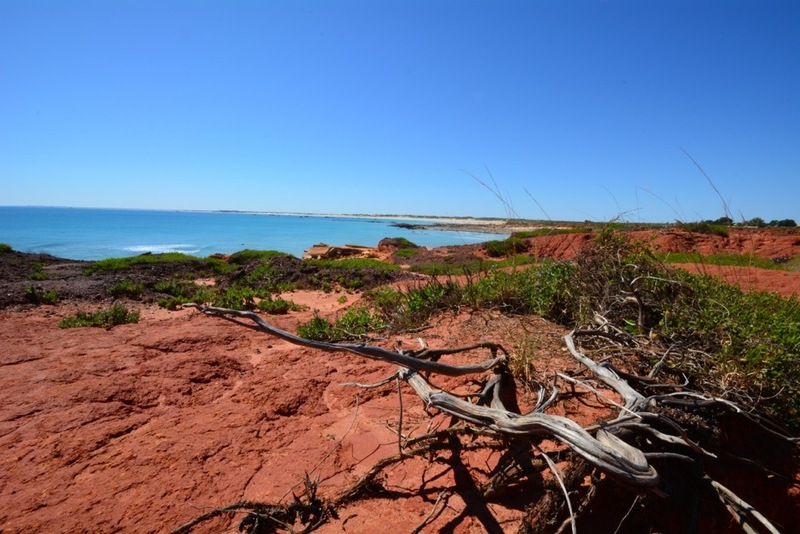 While we were in Broome I also managed a morning out by myself which was bliss! 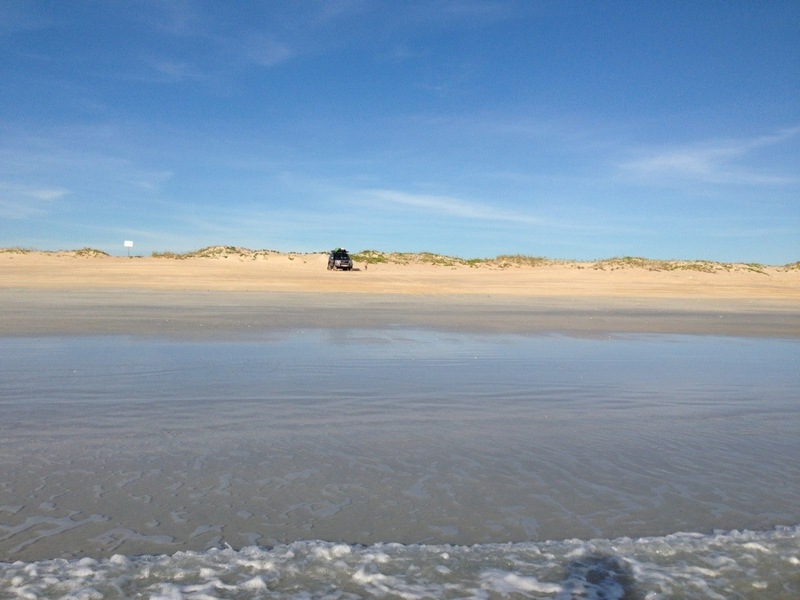 I got some essential waxing done, checked out the shops and bought a new pair of togs – awesome! Matt got his turn too and headed to the physio for a massage to try and sort his sore back out (lots of time in the drivers seat the problem we think!) – it didn’t really help but any time out on your own is a bonus! 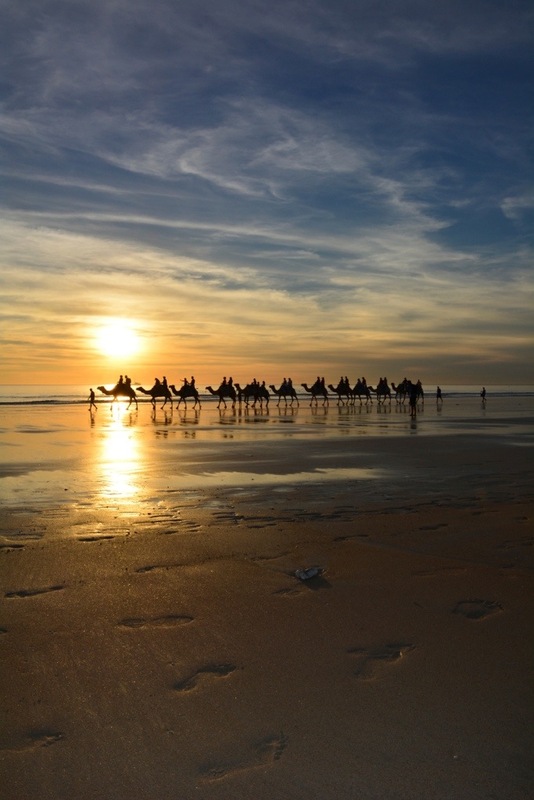 I wish we had more time in Broome, it is a place that weeks could easily be spent in the blink of an eye!! Loved it, loved it! 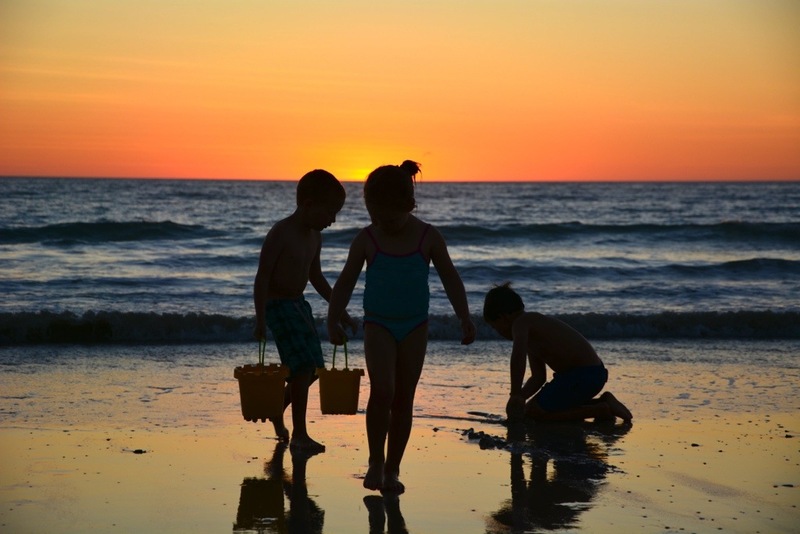 Sooooo hard to drag the kids away from the beach at sunset! 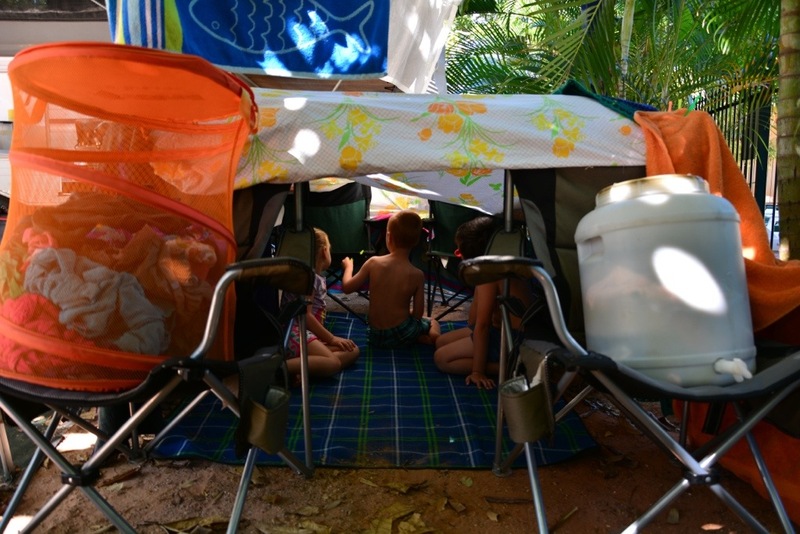 I am madly trying to get this post out while we have reception here in Kununurra – we have sooooooo much we want to share with you all and after two weeks without any phone or internet reception – we have heaps to say!!! 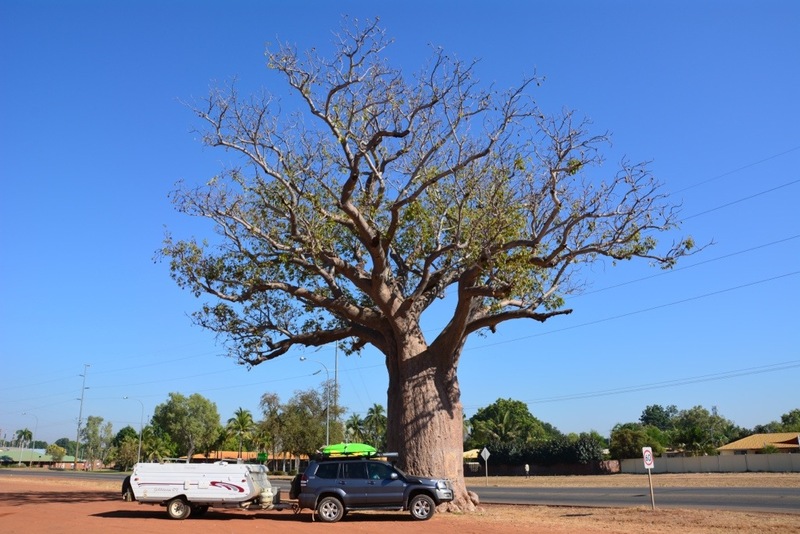 We have just finished a very quick week on the Gibb River Road and are in Kununurra to refuel and restock on food before we spend our final week on the road heading back to Far North Qld. 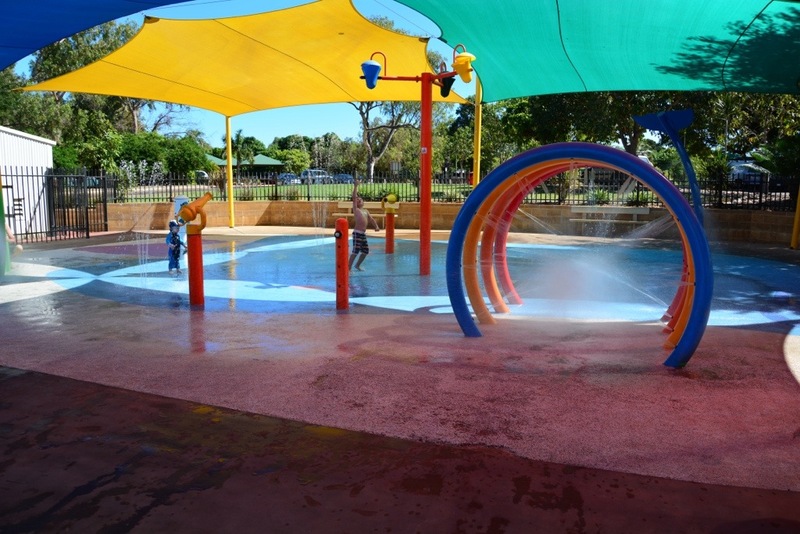 I am sitting in the park ‘watching’ the kids in the playground and Matt is on the phone trying to get a few things organised for our arrival in Mareeba in ten days time. From here – we are just going to drive each day until we decide to stop – lots of long days on the road coming up. We are all feeling a bit sad that we did our last gorge hike at Emma Gorge this morning. The last few weeks on the road have been amazing – so, so, so good! Fingers crossed we get a bit of internet reception over the next few nights so I can pump a few posts out! 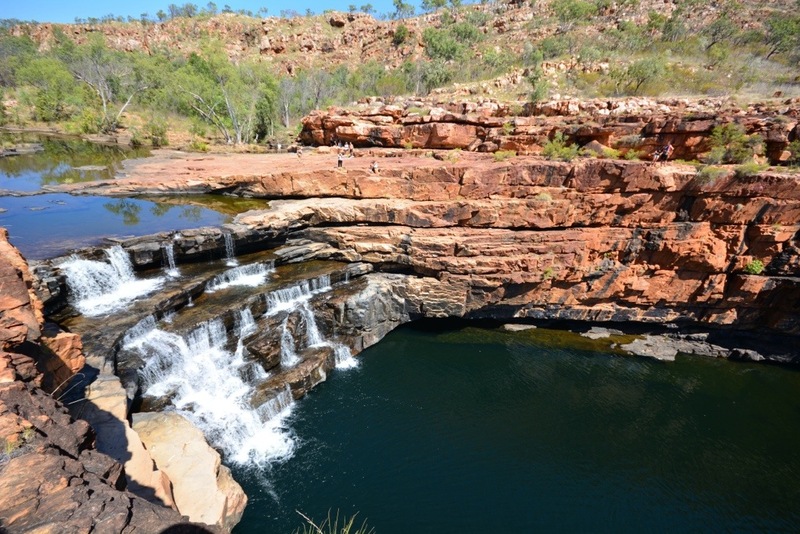 But, in the meantime, I thought I would give you a quick update on what we have been doing since I last did a proper blog entry about our time in Katherine Gorge. 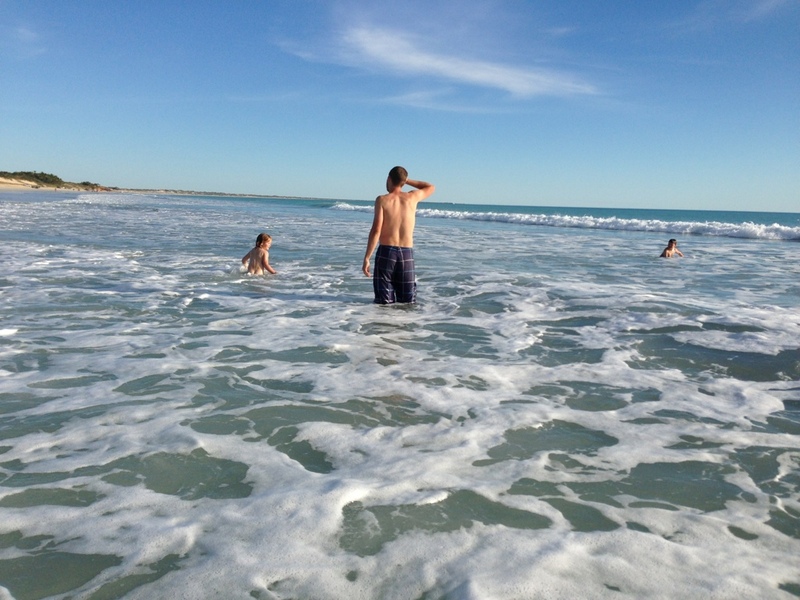 From Katherine we headed over the border into new territory for all of us – Western Australia – very exciting! 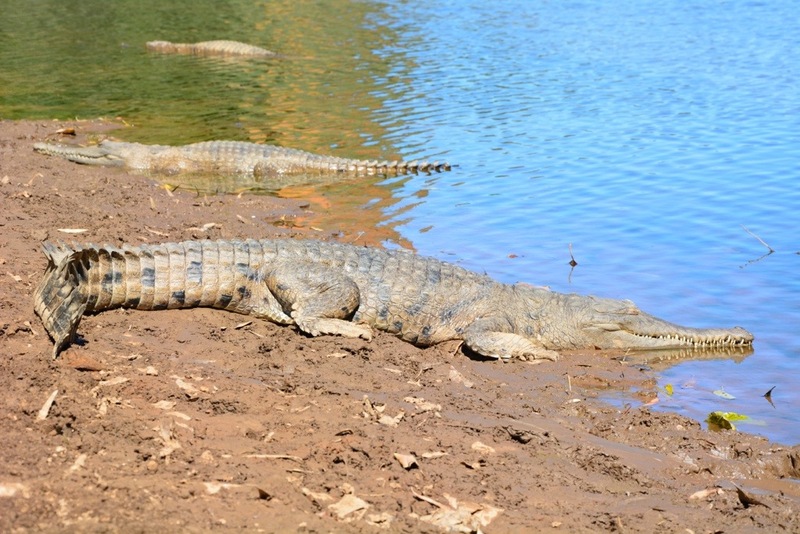 We spent the first two days in Kununurra (yep – we have come full circle as that is where we are today!) getting Peter Prado serviced and new tyres. 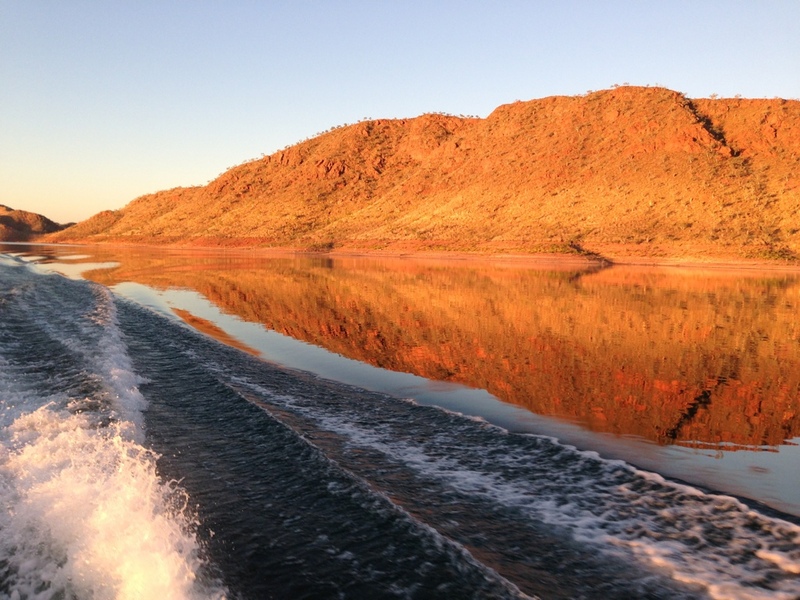 Then we headed out to Lake Argyle which was spectacular! 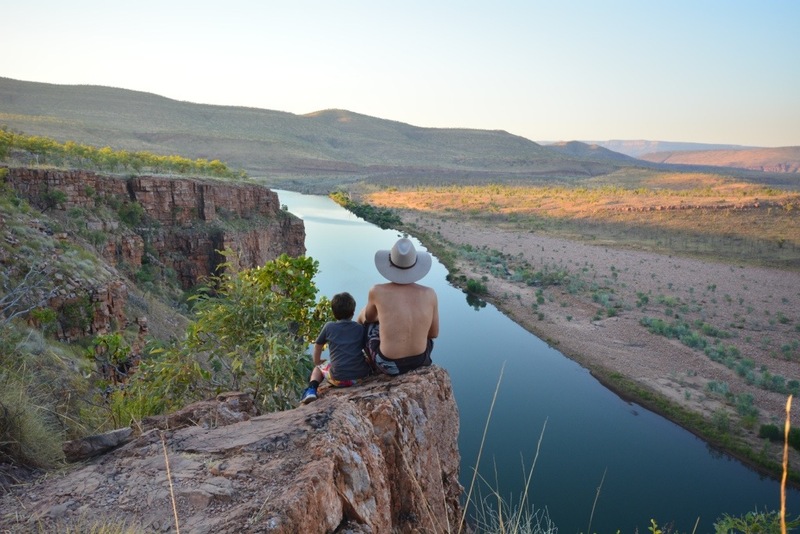 From Lake Argyle we pushed over to Broome (you saw our little video of our time there – so good!). 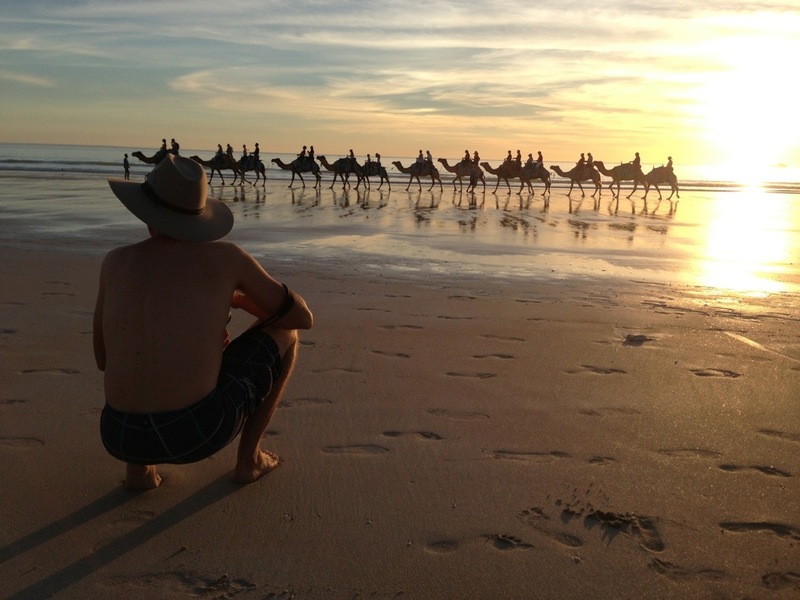 My photographer boy in Broome! 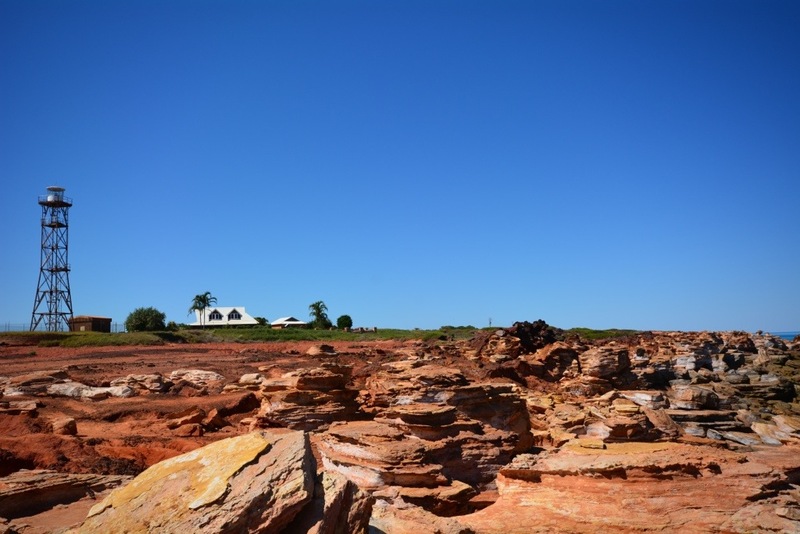 We then spent a week camping at Middle Lagoon and exploring Cape Leveque which was just so beautiful and relaxing! One Arm Point – beautiful! 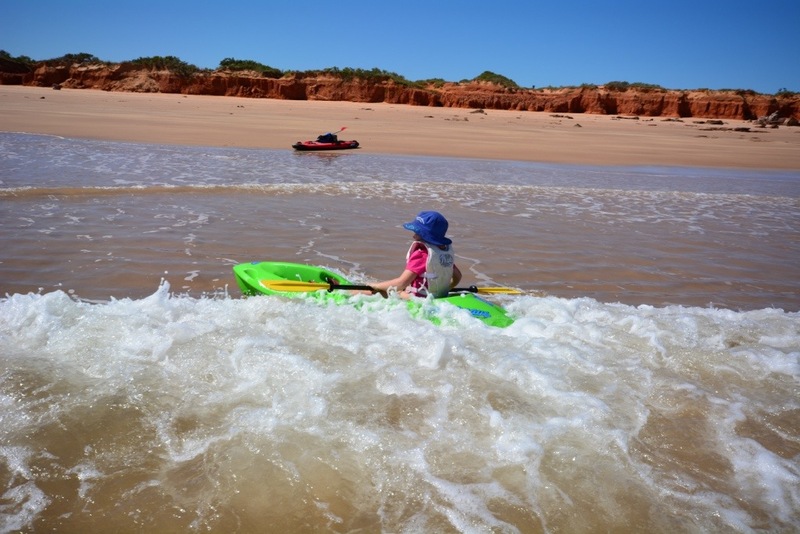 We dragged ourselves away from Middle Lagoon and after talking to lots of other families while we were staying there – we decided to do a quick one week trip along the Gibb River Road to commence our journey back to the East Coast. 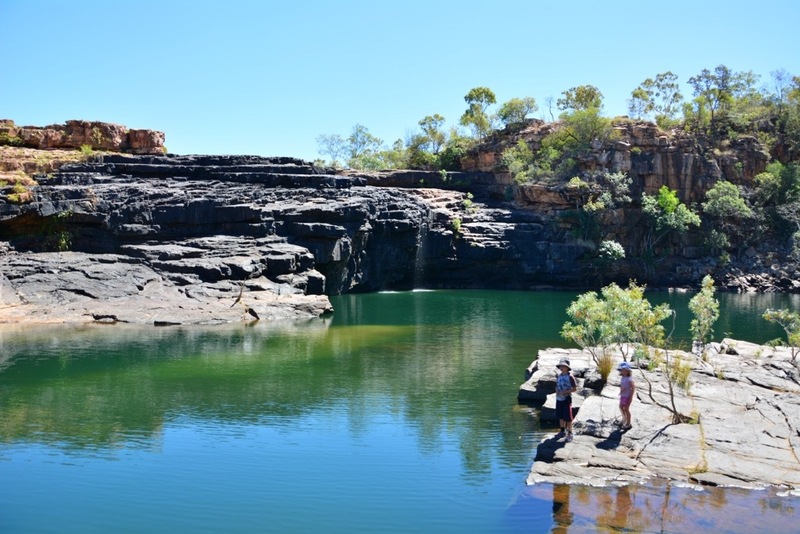 The Gibb River Road was not quite the ‘highway’ everybody said it was – saying it was in very good condition – it was still pretty rough but we have had a great time! Tunnell Creek was definitely a highlight of the trip – amazing! And now it is time to hit the road home. More detailed blog posts on all the fun we have had very soon – fingers crossed for reception tonight! 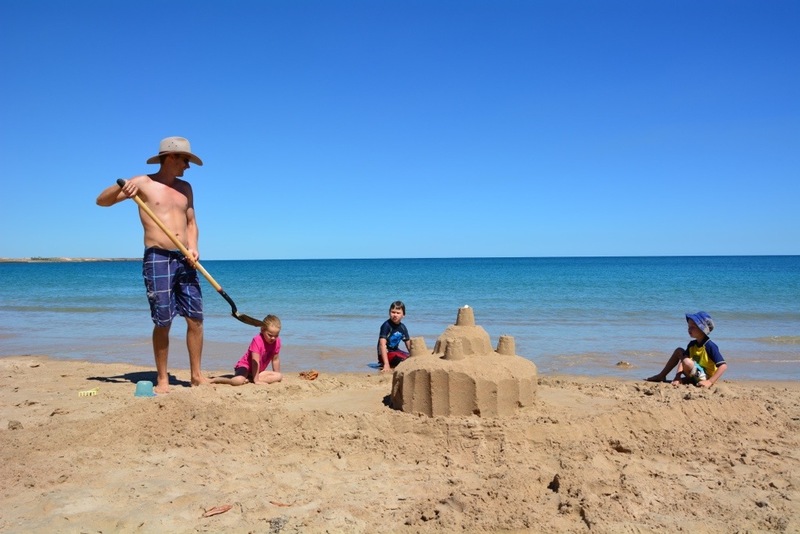 We’re jumping ahead a little with the blog posts, but we just wanted to share the fun we have been having here in Broome over the last few days, before we head out of reception tomorrow. 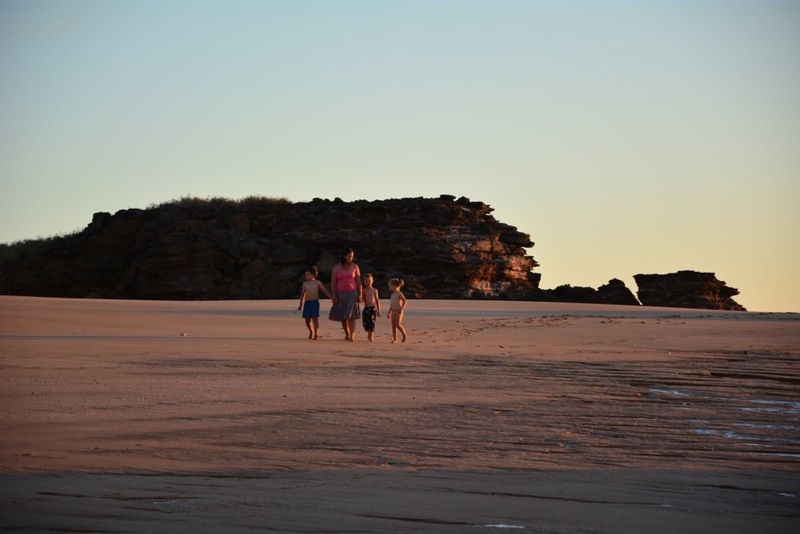 We have loved, loved, loved our time in Broome. We will write a proper blog post about where we went, where we stayed, what we did etc when we are back in reception. 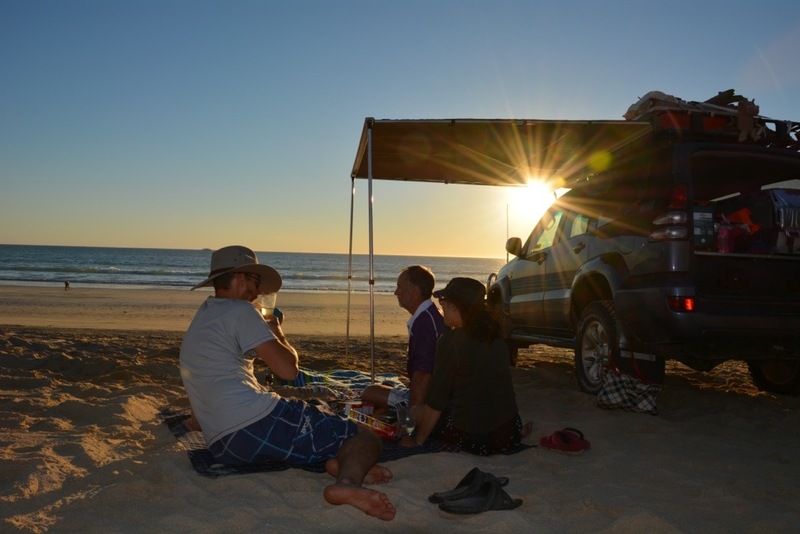 Enjoy Broome – Fealy Family style to the sounds of Zac Brown Band ‘Toes’.